This year’s contemporary program for the Australian Ballet, Verve, is a triple bill of in-house productions. Two extant works by the company’s resident choreographers – Stephen Baynes and Tim Harbour – bookend a new work by coryphée and fast-rising choreographer Alice Topp. Each creator has made vastly different choices in form, music and design, allowing us to not only see the breadth and versatility of the dancers’ skills, but also experience the broad church that is contemporary ballet. The premiere of Topp’s Aurum attracted the most buzz on opening night. Taking inspiration from kintsugi – the Japanese art of repairing broken ceramics with gold metallic lacquer – the work explores ideas of past trauma and the importance of acknowledging, even honouring, these imperfections. 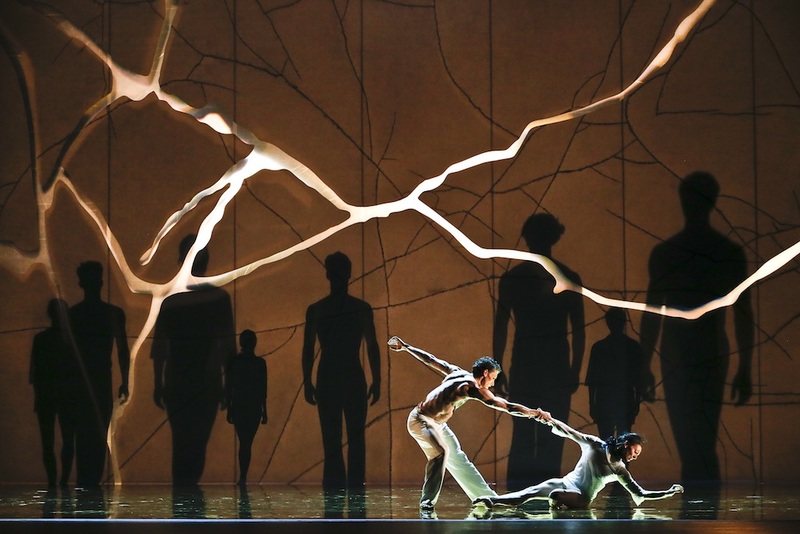 Twelve dancers embody these ruminations through luscious and lyrical choreography, set against Jon Buswell’s stunning design featuring a reflective gold floor and a backlit wall of fractured light. Music by pianist and minimalist composer Ludovico Einaudi sets the tone of the work, adding great emotional weight with its layered repetitions and brooding melodies. Beneath the sparse and meditative score, the movement melts from one idea to the next like the thick gold paint used to repair the imagined ceramics. Whilst avoiding narrative, there are moments of dramatic connection between the dancers. A fall and catch becomes a symbol of support; an embrace reveals tenderness. While the movement vocabulary was enjoyable to watch, compositionally, the piece was hindered by its simplicity. Sequences generally appeared only as a duet or a unison ensemble, which felt inhibiting, especially in the third movement when Einaudi’s score really takes off. Topp’s choreography also relies heavily on slow, intricate and sustained partnering work, not all of which was executed cleanly on opening night. But these matters aside, Aurum offers an emotional potency that not all choreographers manage to achieve. And this is arguably Topp’s desired effect. As an audience, we establish a kinaesthetic empathy with the dancers on the stage who project a real and sometimes unbridled energy out into the theatre. It is exciting to watch, much like Topp’s career as a dance maker will no doubt be. Baynes’ Constant Variants from 2007 opened the evening’s program. The work is set to Variations on a Rococo Theme – Tchaikovsky’s tribute to Classicism and Mozart – featuring an exquisite performance by cello soloist Teije Hylkema. Like the score, the dance is defined by its quiet and restrained quality. At its most simple, the choreography is an embodiment of Tchaikovsky’s phrasing, with each element accentuating and complementing the other. At times the musicality in the movement was so palpable it felt like the musicians and dancers were breathing together. The pared-back score is mirrored on stage, the dancers having nowhere to hide in this technically-demanding work. Indeed, the company rose to the occasion, especially principal artist Ako Kondo who found a supreme balance between strength and poise on opening night. In almost total contrast was the final work of the program, Harbour’s high-octane Filigree and Shadow, which originally premiered in 2015. The program note tells us the work is a “catharsis for aggression” and references the plight of birds who, instead of escaping a hurricane, fly directly into it in pursuit of the calmer air that will carry them to safety above. Sydney architect Kelvin Ho’s set design references this imagery with its imposing white walls and massive half-cylinder. Through Benjamin Cisterne’s clever lighting design, the dimensions, lines and energy of the space are constantly shifting. The stage is alive like the bodies that occupy it. The formation and breaking of lines is mirrored in Harbour’s aggressive and quick choreography. The movement is positioned in Forsythe extremes – deep lunges, arms in open fifth position, high leg extensions in directions that oppose the torso, and fast floor work that sees dancers spring out of the floor as quickly as they fall. The work feels like a metaphorical ‘wringing of hands’: pent up energy that builds then releases, only to build back up again. The electronic sound design by Munich-based collective 48nord (Ulrich Müller and Siegfried Rössert) is dense, complex and unrelenting. The palette comprises strings, rumbling piano notes and distortion, with a smattering of recordings from birds, trains and tightening ropes that add a great deal of texture to the work. In a year of programming by the Australian Ballet that showcases works made specifically for the company, Verve highlights the breadth of its contemporary repertoire. The three works each speak the voice of their choreographer, and do so with confidence and clarity. There is both proven and promising home grown talent that is worthy of viewing.